Our mission is to present a coherent vision of ArtCars to the world. ArtCar Fest is a festival for and about ArtCars, which are registered and insured vehicles that an artist has permanently altered in artistic fashion. These are not parade floats - the unique aspect of our medium is that we bring art into the world every day as we drive our vehicles to work, to the store, and out on the highways. 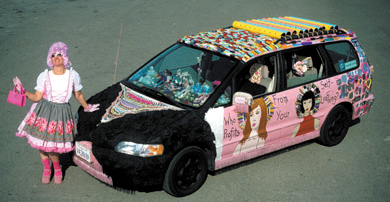 ArtCar Fest was founded in 1997 by Philo Northrup, and Harrod Blank and is now managed by a team of local ArtCar artists. Each year, new artists join ArtCar Fest and, along with previous crowd favorites, share their amazing art with the public at various Bay Area events. © Copyright ArtCar Fest and the ArtCar Fest logo are registered trademarks of ArtCar Fest, Ltd.